DR. ELIAS MALKI is the founder and President of MIDDLE EAST GOSPEL OUTREACH, the Host and Executive Producer of the GOOD NEWS PROGRAM and the President of COMMUNITY INTERNATIONAL. He is one of God’s ambassadors, proclaiming the Gospel of Jesus Christ in the Arabic language via satellite on eight channels throughout the Middle East, North Africa, Europe - over 180 nations - daily. Elias Malki was born in Lebanon, the son of a Presbyterian elder. His father, who was of Assyrian descent, escaped the massacre of Christians in Turkey in 1920, after the Turks beheaded his father for not surrendering to the Islamic faith. He fled to Lebanon where he married his wife, a Lebanese of Phoenician-Greek descent. The family soon moved to Palestine, settling in Haifa, where conditions were better during World War II. Elias felt the call of God on his life at the age of 10. When he was 16, his family moved back to Lebanon. At the age of 19, Elias received the Lord through the ministry of an American missionary. He traveled to the USA to study in Bible school. While there, Elias met and married his wife, Donna. In 1959, he returned to Lebanon with his wife and children. Elias ministered to the people of the Middle East for 62 years. He established a Bible school in Lebanon and traveled extensively in the entire region ministering the Gospel. From 1977 to 1985 he had the first Full Gospel weekly radio program in Arabic broadcasting from the island of Cyprus. In 1982, the doors of opportunity opened wide with the advent of television in the area. Elias became the host of the first Arabic evangelistic TV program, the GOOD NEWS PROGRAM, ever to air on television in the Middle East. The response to the program was incredible and mail poured into the office in Cyprus. Thousands of Middle Eastern people, from the seed of Abraham – Jews and Arabs – have been healed and received Jesus as their Savior. In November of 1995, while he was on a plane from Tel Aviv to London, Elias was approached by a woman he knew. He had not seen her for seven years. She gave him a word of prophecy that God was opening a door for him through satellite television in the Middle East. Six months later a broker representing a satellite network contacted Elias and offered him a slot on satellite television. Through satellite television the GOOD NEWS PROGRAM is becoming more available to viewers in the Middle East, Europe and North Africa. The Middle East and the Arab world use, per capita, more satellite receivers and dishes than any region of the world. The GOOD NEWS PROGRAM is being aired on eight satellite channels and one of those channels it is on three times a day reaching all of Europe, the Middle East, and North Africa. In 180 nations of the world people are receiving the program every day. Dr. Malki is also involved in training leaders three to four times a year in his facility on the island of Cyprus, as well as holding crusades in Israel, Europe, and the United States. The Good News Program has been airing for 33 years. MIDDLE EAST GOSPEL OUTREACH is an international Christian outreach to Middle Eastern countries and Europe. 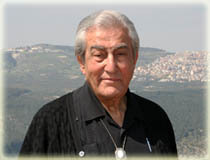 Founded by Dr. Malki in 1976, MEGO sponsors pastor’s leadership conferences, missionary conferences in churches, produces the GOOD NEWS PROGRAM (broadcast via satellite daily in over 180 nations), distributes food and medical supplies through COMMUNITY INTERNATIONAL (also founded by Dr. Malki) to the needy areas of the Middle East. MEGO is a member in good standing with the NATIONAL RELIGIOUS BROADCASTERS and EFICOM (Ethics and Financial Integrity Commission). If Dr. Malki is speaking at your church or gathering click here for a ministry flyer.